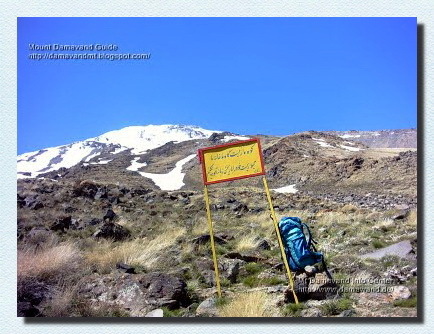 The latest GPS Landmark for your travel to Mt Damavand Iran (update 14 July 2009). It is a very useful guide specially in case of bad weather and foggy condition, it may save your life. and return the same way back. If you have enough time and energy left You may also visit the beautiful Icefall at 5100 M.
GPS Landmark Damavand South Route. Tehran East Public Coach Station. A good place to find a car or a bus towards the mountain. 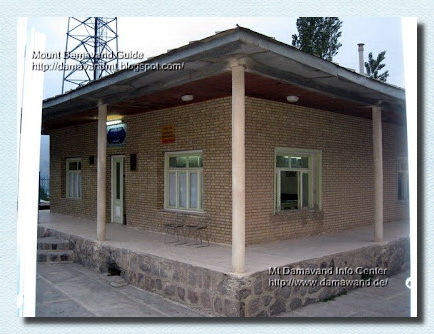 Polour Resort is the best starting point for Damavand South and West routes. A good place for your rest and accomodation. This Complex Campsite is made by Iranian Mount Federation. This landmark is also useful to visit Poul e Moon Caves. 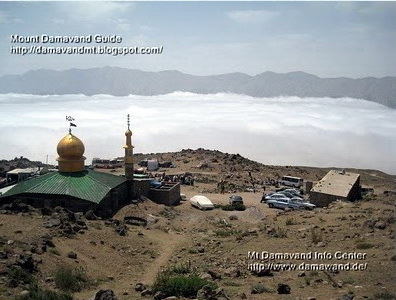 (if you travel from Tehran to Damavand, you do not need this landmark ). Camp 1 Reineh is the olest campsite in the area. 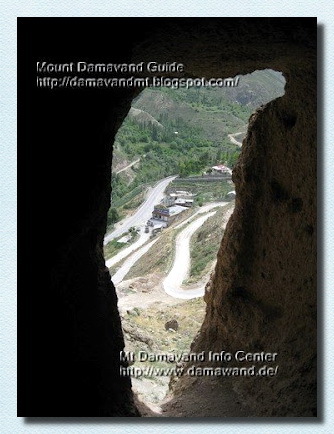 If you travel from Tehran to Damawand, you do not need this landmark. The winter staring point and beginning of gravel road to basecamp. When it is imposible to use the gravel road by car due to snow and ice condition you have to start your ascend from this point. You may also start your trek from this point in summer season if you wish so. When you travel either from Tehran, via Camp1 Polour Resort or from North of Iran, via Camp1 Reyneh town, you will come to this junction anyway. 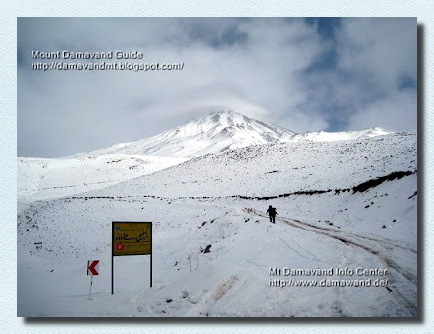 Turn right here to goto damavand base camp. 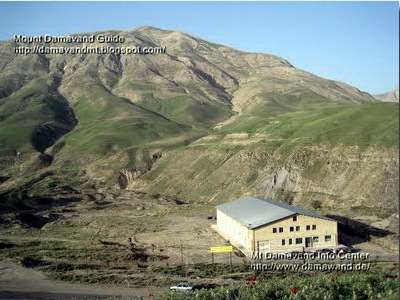 Camp 2 Base (Farsi Name Gosfand Sara), there is a shelter, a mosque and a sheepfold . During summer you can find water and some food here , but it is recommend to use your own. You may find mule and porter to carry your equipments to the next camp. Remember in other seasons base camp is a remote area. This camp is not suitable for use in summer, because it is too crowded and too dirty, for acclimatization you may use camp1 Polour or Camp3 Bargah Sevom instead. Read also warnings about BaseCamp. Interesting place to take some photo of damavand volcanic statues. Seasonal river, it is usually dry in summer and coverd with snow in colder seasons. The same seasonal dry river. Camp3 Bargah Sevom is the last campsite on the south route, during summer season the shelter/refuge it is too crowded and in not suitable for use, it is recommended to book the new hut or bring and use your own tent for better comfort and privacy. You may find water, some food, rent tent and sleeping bag at this place in summer, but it is better to use your own equipments. A New Hut was constructed in 2009 in this area and is ready for use now. The Camp3 New Hut is made at altitude 4250 m above sea level, just near the old shelter Bargah Sevom, it is one of the highest huts in the word and best resting place in the area. You have about half an hour hard work from here! Get ready for sulphuric smell of the mountain! South Face Summit. Congratulation you have done it! This is the peak, summit of Iran, and Middle East, top of the second highest volcano in Asia and peak of second highest volcano in the Northern hemisphere. 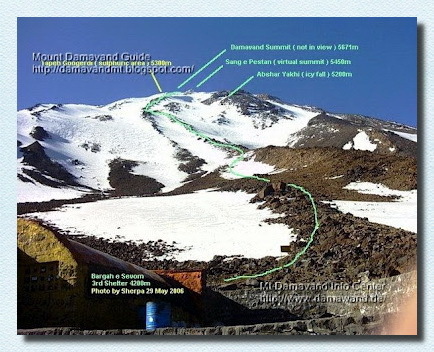 Damavand South Face Summit is measured as 5,671 Meters, 18,605 feet in all old world records. You may also be intrested in these topics Google Earth and Maps. the angular distance of a place north or south of the equator. 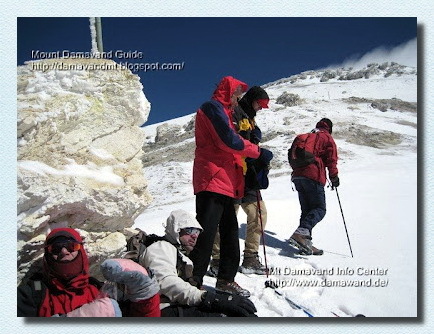 Regarding the height of Mount Damavand, we believe hand held GPS unit results are not so accurate to refer to as a reliable reference and we think it worth to do some accurate measurements with some sophisticated equipments like advanced differential GPS. (Last edited by Sherpa on 2 Sep 2007). Damavand Süd-Route GPS Sehenswürdigkeiten und Wegpunkte. Trekking, Klettern, Ski-und Snowboard-Touren 2015 Ski-Expedition Tour zum Iranski Resorts in Alborz Mountains. Informationsquelle für aufsteigend Damawand und Iran Berge. Bergsteigen & Handheld-GPS-Empfänger. Demawand Südwand GPS-Tracks und Satellitenbild. Persische Kultur-Tour Video. Abenteuer Wanderurlaub Tapeten und Bild. Hochwertige Tapeten Iran Skitouren. Damavend Karte. Low-Budget-Tour in den Iran Demawand. 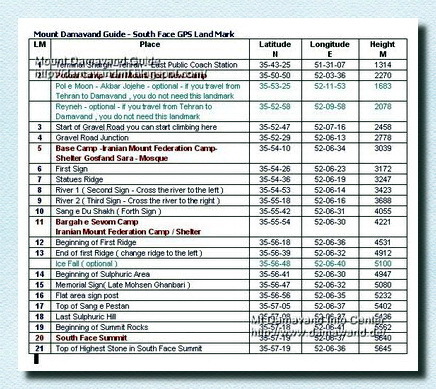 Damavand south route GPS landmarks and waypoints. Trekking, climbing, ski and snowboard tours 2015. Ski expedition tour to Iranski resorts in Alborz Mountains. 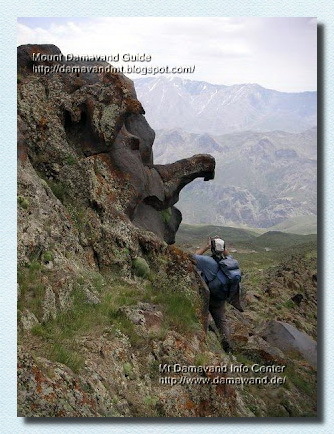 Source of information for ascending Damawand and Iran mountains. Mountaineering & handheld gps receivers. Demawand South face GPS tracks and satelite image. Persian cultural tour video. Adventure hiking holiday wallpaper and image. High quality wallpaper Iran skitouring. Damavend Map. Low budget tour to demawand iran. Damavand ruta sur GPS hitos o puntos de interés. Trekking, escalada, esquí y snowboard giras 2015. Viaje del esquí expedición a Iranski resorts en las montañas de Alborz. Fuente de información para ascender Damawand e Irán montañas. Montañismo y receptores GPS de mano. Demawand Sur pistas cara GPS e imagen satelital. Persa culturales video tour. Aventura senderismo wallpaper vacaciones y la imagen. Fondos de escritorio de alta calidad Irán skirando. Damavend Mapa. Recorrido de bajo presupuesto para demawand iran. Damavand itinéraire sud de sites connus et points GPS. Trekking, escalade, ski et de snowboard visites 2015. Ski Expedition Tour à Iranski stations Alborz Mountains. 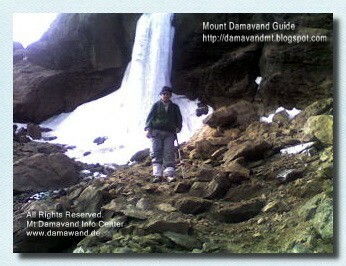 Source d'information pour monter Damawand et l'Iran montagnes. Alpinisme & récepteurs GPS de poche. Demawand Sud pistes visage de GPS et de l'image satellite. Persique tournée vidéo culturelle. Randonnée aventure de papier peint de vacances et de l'image. Fond d'écran de haute qualité de l'Iran skirando. Damavend Plan. Visite faible budget demawand iran. 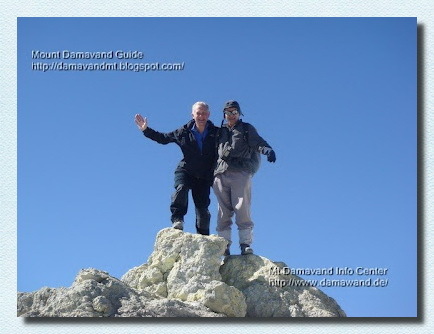 Damavand rotta sud monumenti e waypoint GPS. Trekking, arrampicate, sci e snowboard 2015. Ski Tour spedizione Iranski località di Alborz Mountains. 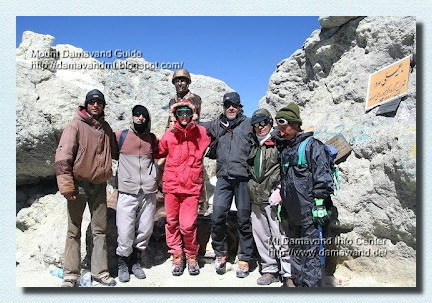 Fonte di informazione per salire le montagne Damawand e Iran. Alpinismo e ricevitori gps portatili. Demawand Sud tracce faccia GPS e l'immagine satellitare. Persian video tour culturale. Avventura trekking parati vacanza e immagine. Carta da parati di alta qualità Iran sci-alpinismo. Damavend Map. Tour Low budget a demawand iran. Damavand sør rute GPS landemerker og veipunkter. Trekking, til klatring, ski og snowboard turer 2015. Ski ekspedisjon tur Iranski skianlegg i Alborz-fjellene. Informasjonskilde for stigende Damawand og Iran fjellene. Fjellklatring og håndholdte GPS-mottakere. Demawand Sør ansikt GPS-spor og satelitt bilde. Persiske kulturelle tour video. Eventyr turer ferie tapet og bilde. Høy kvalitet tapet Iran skitouring. Damavend kart. Lavt budsjett tur til demawand iran. Damavand юго маршрут достопримечательности GPS и путевые. Походов, скалолазания, лыж и сноубордов туры 2015 Лыжные экспедиции тур в Iranski курорты Эльбрус гор. Источник информации для восходящей Damawand и Иран горы. Альпинизм и портативные GPS приемники. Demawand южной стороне GPS треков и спутник изображения. Персидский культурный тур видео. Приключения походы праздник обои и изображения. Высокое качество обои Иран skitouring. Damavend Карта. Низкая тур бюджет demawand Иран. Damavand yugo marshrut dostoprimechatel'nosti GPS i putevyye . Pokhodov, skalolazaniya , lyzh i snoubordov tury 2015 Lyzhnyye ekspeditsii tur v Iranski kurorty El'brus gor. Istochnik informatsii dlya voskhodyashchey Damawand i Iran gory. Al'pinizm i portativnyye GPS priyemniki . Demawand yuzhnoy storone GPS trekov i sputnik izobrazheniya. Persidskiy kul'turnyy tur video . Priklyucheniya pokhody prazdnik oboi i izobrazheniya. Vysokoye kachestvo oboi Iran skitouring . 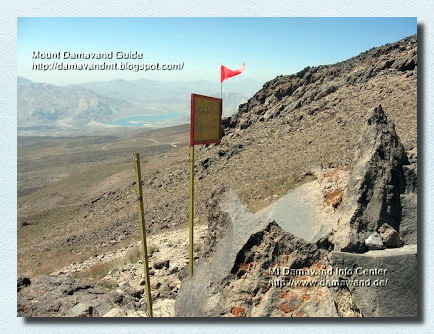 Damavend Karta . Nizkaya tur byudzhet demawand Iran.